I try each week to review at least one new album. 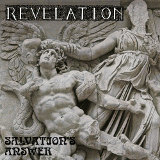 However, this week Baltimore-based prog/doom power trio Revelation's first LP, Salvation's Answer, arrived, and it's definitely worth a review, especially since Shadow Kingdom Records just re-released it. Revelation is nowadays more prog than anything else, and has moved rather far from their metal roots, but as this is the first LP since they originally renamed their band after a Trouble song, the listener can reasonably expect -- and receives -- an excellent doom metal offering. But if one likes one's doom metal slow and funereal, this isn't the right album. While it's indubitably doom, these tracks are some of the fastest of its kind in the genre. The sound is at first familiar and easy to get into in Lost Innocence: Echoing drums -- flat but filled with deadly finality --, a dragging guitar line filled with Candlemass-style riffs, and a bass that follows the guitar with slavish grimness. Vocalist John Brenner sounds a little like Messiah Marcolin, with a punkish undertone to his voice that reminded me a little of Coven's David Landrum; so far, a decent doom track, but no surprises, right? Wrong. Halfway through, they abruptly shift the pace of everything up to that of 80s speed metal, pounding relentlessly at the listener. The title track, gentle-sounding, sad, and introspective even during the majority of the song's distorted power chords, moves to a clean third verse at the end after some dark, echoing arpeggio solo work by bassist Bert Hall Jr. I listened to it several times to get the full breadth of what they mash together on this track, since at the end they also speed this one up and pair it with a ripping guitar solo, as Brenner ends the deeply religious lyrics almost at a scream. Infinite Nothingness is less epic, but it, and the instrumental that follows it, are also well worth the listen just for the combination of speed and crushing heaviness on display. I don't know if it's the re-release or if the original production had the same fineness of drum sound, but that's strongly noticable throughout the album, and it somehow fits perfectly with the hollow but still careless-sounding tone of Brennan's voice. Images of Darkness and Long After Midnight are both more meandering after the initially fast tempos, with a long, almost lazy solo on Long After Midnight sounding a little like something from later Ozzy-era Black Sabbath, right before the band goes back to the faster, more disciplined sound they started with. Poets and Paupers instead stripes its slow and fast moments (and there are plenty of both) through the songs, going slowly over the verse parts, while the final track, Waiting for...the End, almost completely ditches the speed metal in favor of a slower and more deliberate sound, though the band can't seem to resist fast, thrashy riffs for long, at least on instrumental parts between the verses. The screaming-guitar solo that starts up partway through this one, just like the abrupt stops in portions of the song, are both very reminiscent of Trouble's approach -- and the massive riffs combined with light-stepping speed serve Revelation just as well as its influence. I hadn't listened to any Revelation before this album, but now that I have, this rates extremely high on my list of doom albums of the late 80s and early 90s. Salvation's Answer is the bright start to what we know now as a stellar career later on, and the label's claim that "there's nothing quite like this album" is clearly not just hype.